It may sound like a job that deals with animals, but Army Veterinary Food Inspection Specialists are actually tasked with inspecting the food that they and their fellow soldiers eat. They're the ones who test and inspect all food that goes into the meals-ready-to-eat (MREs) that soldiers rely on in the field. They approve all food vendors that work with the Army and taste and sample all the food at Army facilities. These soldiers may be deployed, or stationed at Army garrisons around the world; even though they deal with food, these soldiers aren't always confined to the kitchen. This important Army job is categorized as a military occupational specialty (MOS) 68R. 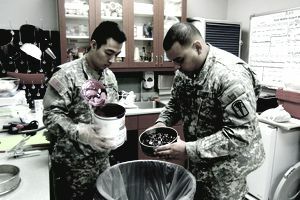 These soldiers inspect all food products intended for human consumption. Using statistical sampling methods they make sure food is being stored at safe temperatures, and ensure that all food items are packaged according to Department of Defense standards. MOS 68R collects samples for lab testing and looks for any unsanitary food storage conditions at facilities and commissaries. It's up to them to maintain and operate any inspection equipment. They're also tasked with being on the lookout for any pests, in food and water supplies, and recommends any necessary corrective actions when unsanitary conditions are discovered. If you're planning to pursue this job, prepare for ten weeks of Basic Combat Training and eight weeks of Advanced Individual Training (AIT) at Fort Sam Houston in San Antonio Texas. This will include training in food safety and protection and quality assurance. You'll learn how to inspect meat, poultry, water foods, eggs, dairy products, and fresh fruit and vegetables, and how to identify unsanitary conditions in food storage facilities. There's no Department of Defense security clearance needed for this job, but you'll need to score at least a 95 on the skilled technical area of the Armed Services Vocational Aptitude Battery (ASVAB) tests. In addition, you'll need to have normal color vision and have a strong sense of smell. You should have high school- or higher-level credits in math and science.